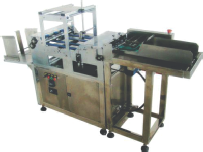 Equipment for printing on medical packaging like pouches, lidding and rollstock. Product identification feeder/printer systems for medical printing directly on Tyvek pouches and Tyvek lidding. Will also print directly on foil pouches. Thermal transfer printers, inkjet printers; hot stamp and hot roller printers. Tabletop and floor based printer systems, as well as integrated in-line medical packaging printers. Also product transport systems for medical packaging for a complete turn-key coding, printing or labeling solution for medical products or medical packaging like Tyvek pouches and Tyvek lids.